It is ever so easy for Real Women to get deeply pulled in to our day-to-day challenges and activities. We seem to be perennially beating deadlines at work, making customers happy, managing our busy family’s schedules, and getting chores done. We get so focused on our to-do lists that we can easily get absorbed and stressed, and weeks can go by before we pause to take a breath and bring our heads above water enough to take a look at the rest of the world. Certainly, we all try to stay in tune to world events by catching up on the news or reading our online sources so we can be somewhat in touch with happenings beyond our immediate scope. But how often do we really take a clear view at bigger pictures? This weekend my son and I took a road trip to visit his Grandpa and Grammy. 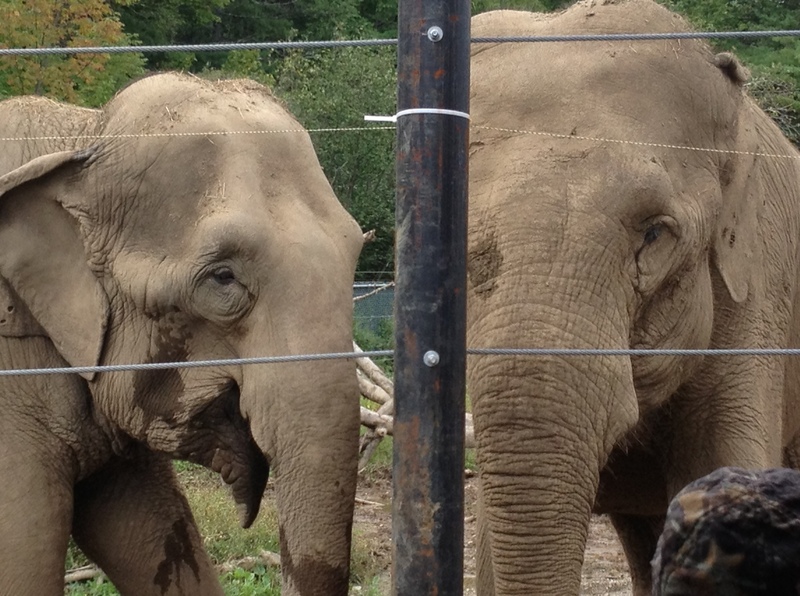 On Saturday, the four of us took a ride to Hope, Maine, a small rural town, to visit a non-profit organization that is caring for two retired circus elephants. My Dad has always had a passion for elephants, so we thought this would be a fun excursion. What it proved to be was educational and eye-opening. This small group of volunteers, including a sharp, caring and charismatic Veterinarian, have indeed been nursing back to health two elephants that came to them injured and ailing. In less than a year, through the wonders of medicine, physical therapy, hydrotherapy and even acupuncture, the giant creatures are doing great and likely will have a comfortable retirement. However, caring for Rosie and Opal is only a small part of the picture. The greater mission of this organization is to educate the public on what is happening to this now endangered species. Wild Asian elephants are being poached by the thousands for their ivory, a highly-sought-after status symbol in countries like China. There are currently only about 30,000 of these amazing beasts left in the wild, and at the current rate of destruction, they could likely be extinct by 2020. That is only 7 years away. I had no idea the problem was this drastic — in my little world, I just hadn’t noticed. Surprisingly, this organization has determined that much of the Chinese population is not even aware of where the ivory is coming from. So the Hope for Elephants group plans to continue to spread their message, not only through any means possible in this country, but also has great ideas like launching an Educational Campaign via Skype to students in China. As we left the facility, I was struck by the fact that this handful of people in a small rural town in Maine, who are 100% volunteer and exist only by donations, always have their eyes and hearts on something bigger than themselves – literally and figuratively. They have the true hope, and belief, that they can make a difference in a really big way and are determined to find ways to do it. (www.hopeelephants.org). I’m sure that they have their own daily stresses and strains, and just like each of us, have to figure out how to pay their bills, get their children to sports practice, and meet deadlines. But somehow, they are managing to keep their heads above that water line and seeing a Big Picture — every day. Who would have thought a fun outing could be so inspiring. Sure, most of us won’t be finding personal missions that include things like saving a species of elephants, but certainly we could do well to consider there is a big world out there, much of which needs our attention. After meeting Rosie and Opal and their caregivers, I’m hoping that I will remember a bit more often to lift my head up, put the small stuff into perspective, and take more notice of what part I can play with the big stuff. This entry was posted in Helping others and tagged big picture, conservation, elephants, endangered species, non-profit, organizations, world views. Bookmark the permalink.